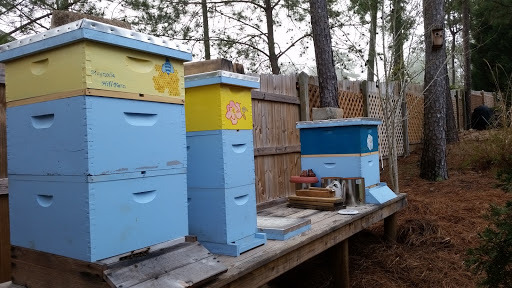 It’s official — if we are going to expand the bee business, we need to build a workshop at the farm! 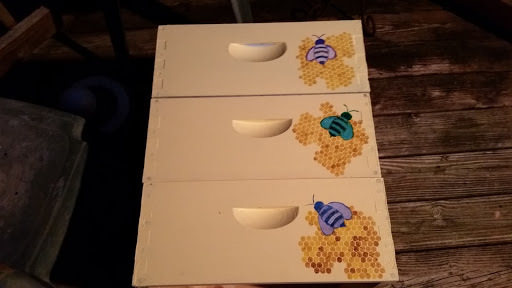 We have bee boxes everywhere, and we have locations to set them up when the bees arrive at the end of the month. It’s been a lot of work getting everything painted, but it’s been fun and stress relief, too. 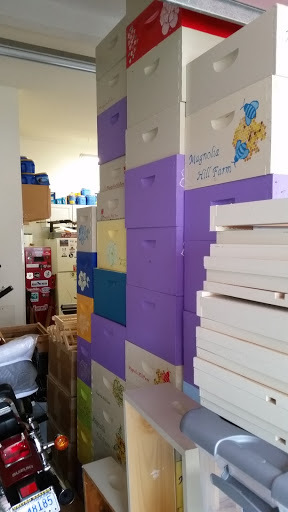 As you can see, we have no room in the garage and we still have boxes in the dining room. We have to put foundation in a bazillion frames over the next two weeks, and I’m hoping we can do that sitting in front of the TV because it sounds like tedious work. So tedious, that grading essays might be more enjoyable, especially as my students are writing very well right now. The existing hives are doing well and we have had to add to each of them. I like seeing some of the new colors out there mixed in with our original blue boxes. 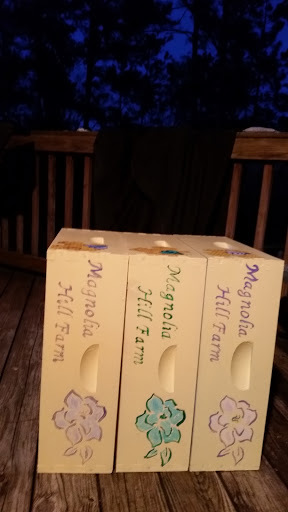 We realized that we will need to make multiple trips to get everything we need to move down to the farm before spring break, so we’re hauling a load of supplies down there later today. It will be good to stand on our land and see the early signs of spring for the first time. We’ve seen it late summer, fall, winter, and in torrential rain that was more befitting a hurricane coming in than a winter storm. If we can fit them on the truck, we’ll take a few plants down and get them in the ground too. It will be a very quick trip there and back because we both have a bunch of deadlines for projects for our day jobs before spring break. It’s been too long since we sat around a camp fire with family, so a quick trip and a day dream is better than no trip at all. Of course, I’m hoping to find that giant gold nugget in our churned up soil so that I can be a step closer to sitting in our workshop, painting hive bodies and bird houses to my heart’s content. Previous Post One Bee of a Headache! Next Post Putting down roots.